More About This Title Pit Pat! Tip Tap! What different objects can children use during play? Find out in this photographic non-fiction book. • Pink/1A - A simple non-fiction book. 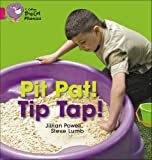 • Focus phonemes: s, a, t, i, p, n, m, d.
• Photos of each of the items on pages 14-15 help children to recap the book and provide a wealth of speaking and listening opportunities.